Sandos Caracol Eco Resort sits on the white-sand Playa del Carmen beach, overlooking Cozumel Island around 5km from the city centre. Providing an all-nature experience, this eco resort is set in a tropical garden and surrounded by mangroves where guests can keep their eyes peeled for iguanas, peacocks, donkeys and turtles. There’s also an idyllic natural cenote on site, (unique to Mexico), where you can enjoy a swim. The hotel features a spa, nine restaurants and bars, two outdoor pools, and rooms that overlook the blue Caribbean waters. A great option for all inclusive holidays, Sandos Caracol Eco Resort offers separate accommodation areas for both adults and families. 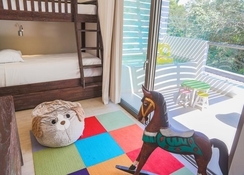 If you've got the kids in tow, the hotel has an exclusive club which organises activities and games to keep children entertained, including film screenings, rock climbing and trips to the nearby waterpark. The Sandos Caracol Beach Resort & Spa is located just steps away from the beach in Playa Del Carmen, along the Caribbean coast. It’s 15 minutes from Cozumel airport around 3.2km from the Church of Guadalupe. 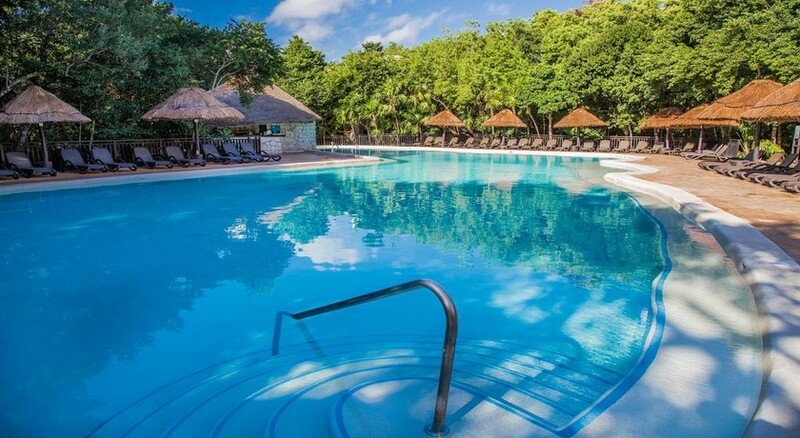 Sandos Caracol Eco Resort offers over 700 rooms and suites across multiple buildings. 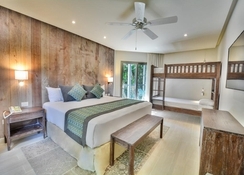 While couples without kids can choose from Superior, Deluxe, and Penthouse categories, families can pick across various categories, ranging from Standard to Signature Eco Family Suite. While all rooms come with private furnished patios or balconies, the most high-end include whirlpool tubs and ocean views. 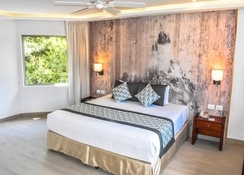 The exclusive Royal Elite accommodation options are located by the beach and comes in four categories: Royal Elite Superior, Royal Elite One Bedroom Suite and Penthouse Royal Elite. Sandos Caracol Eco Resort hosts nine restaurants, including six serving an a la carte menu, with the others offering buffet meals. While La Laguna dishes out International buffets for breakfast, lunch and dinner, La Toscana serves Italian breakfast and lunch buffets, and Las Mascaras a casual Mexican dinner buffet. From the a la carte options, you can order a Japanese, Brazilian or Mediterranean style cuisines. Unwind with a cocktail or two in the nine hotel bars, with two pool bars, a beach bar and more. Guests at the Sandos Caracol Eco Resort get private access to the white-sand beach, where you can take a dip in the calm blue waters, perfect for scuba-diving, windsurfing and kayaking. Check out the hotel’s adults-only freeform pool, where you can relax under the shade of thatched umbrellas and relax with a drink in hand. 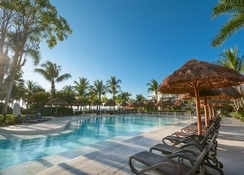 The second pool offers a swim-up bar and is popular for livelier guests, with pool games. The on-site spa encompasses an outdoor hot tub complex, a sauna and fitness centre, where guests can do a spot of yoga. 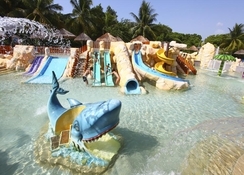 Kids, and adults too, will love the waterpark, with 29 waterslides and lots of play areas. A kids’ club also takes care of movie screenings and activities like rock-climbing, dance classes, etc. Guests can also play tennis on well-lit courts, snorkel in the on-site cenote, take a rowboat river cruise and enjoying traditional Mayan performances in the evenings. You can also venture out to explore a Mayan village or pay a visit to Xel-Ha, the world’s largest aquarium. When booking more than five rooms as a group, different policies may apply. With the amazing natural resources like the senote - natural cold water we could snorkel in and heel sunburn! Restaurants were accommodating to all tastes there were a couple that had to be prebooked- the Japanese one put on a great show whilst making our scrummy food, the one on the beach was our favourite. Would love to return one day!